Born and raised in Washington’s Pacific Northwest, Sheri tagged along on family hiking outings throughout her youth. She found her love of water and wilderness on the salty shores of the Salish Sea among salmon and cedar. In 1999, she departed the rain-drenched temperate forests of Washington’s Olympic Peninsula for another very wet place on the planet: Kauai Island in the Hawaiian Archipelago where she has resided for the past 16 years. Sheri studied at the esteemed Huxley College for the Environment. From her very first field season monitoring seabirds in Puget Sound, she knew her life was destined for the outside. Her career has included leading wilderness expeditions and guided adventure trips in Washington, Montana, Wyoming, Colorado, Hawaii, Australia and Fiji. A skilled and inspired environmental educator, she taught forest and stream ecology at Olympic Park Institute, and has guided adventure trips all and served as an interpretive and environmental education ranger with the US Fish and Wildlife Service at the Kilauea Point National Wildlife Refuge for many years. Sheri’s keen interest in protecting seabirds and marine mammals led her to an obscure hobby collecting marine debris and in 2006, she founded the Kauai Chapter of the environmental non-profit Surfrider Foundation. In 2009, she traveled to the atolls of the Northwestern Hawaiian Islands where she conducted research of nesting Hawaiian green sea turtles research at a remote field camp on East Island, French Frigate Shoals. Whenever humanly possible, Sheri seeks out opportunities travel, study and reach the most remote of wild places. An accomplished naturalist, Sheri thrives sharing her passion for nature with learners of all ages, instilling a sense of wonder, a sense of place and a sense of stewardship. Every Fall, she heads up to Churchill, Manitoba, Canada leading polar bear expeditions. Each summer, Sheri follows the annual migration of the Laysan albatross, Pacific Golden plover and Hawaiian Humpback whale, and returns to guide trips with Austin Adventures in South-central Alaska. 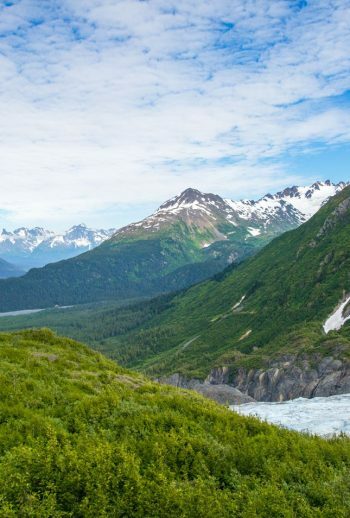 Sheri is at home on the Kenai Peninsula, immersed in temperate rainforests, introducing visitors to the natural world, and exploring seabird rookeries of Kenai Fjords National Park. That’s right, you guessed it: Alaska’s Kenai Peninsula! From the salty fishing docks of Seward to skipping rocks to ocean side cedar campfires, and polar bear dips, sea kayaking with orcas, exploring seabird rookeries and calving glaciers in Kenai Fjords, Sheri loves all of Alaska -wild and free. “Gird to Bird” also known as the Girdwood to BirdPoint Bike Ride along Turnagain Arm/ FJORD! This is it: hiking up the lateral moraine of Exit Glacier to Harding Icefield. Some of my favorite memories there with ALA guests: Making snow angels, howling like wolves, singing Barry Manilow and being there for one of nature’s greatest WOWs. “National Lampoon’s Vacation” is reee-al nice! The first time I packed my bag for white water camp in grade 7..and the first night I set up camp in the Grand Teton range. Nepal, Australia, Fiji, Mexico, New Zealand, Thailand, Cambodia. In the Winter you’ll most likely find Sheri scouring Kaua’i’s shores for marine debris, sharing her love for Hawai’i natural and cultural history with visitors and practicing La’au Lapa’au, Hawaiian Medicine. Sheri loves distant and wild nature and travels the globe seeking out wildlife and wild places. Spring will surely position her somewhere distant and remote, and always learning!